Max A Shacknai COVE News | News and updates about the Max A Shacknai COVE at Colgate University. Risako Yang ‘21 is studying English and Biology. Her interest in working with the community stemmed from her interest in people. She has worked with the organization Ashinaga since the 6th grade. Ashinaga is an organization in Tokyo, Japan that provides educational and emotional support to children who have lost one or both parents. 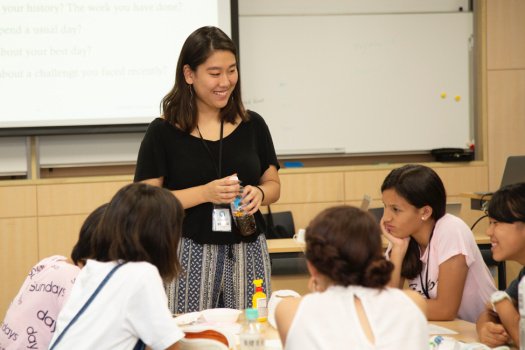 Additionally, she has supported the organization SKY Labo, an NGO founded in 2016 to encourage women in STEM in Japan through summer programs with a curriculum focused on design thinking. She worked with the teaching staff to establish curriculums both for the students and the design coaches (interns). In addition, she works as a bilingual design coach, helping Japanese middle school and high school students to learn in a completely English environment. Community service means mutually receiving and learning from each other, rather than one party “helping” others. What has been one of your most meaningful experiences in the nonprofit sector? Working with SKY Labo, I got to observe some of the students’ expressions change in the matter of three days. Seeing how such a short program could change the girls’ attitude towards education and their own futures made me wonder how the Japanese education system should change more dramatically in the future. When the earthquake and tsunami hit Japan in 2011, I wanted to work with the victims directly. The money I had fundraised at my school had gone to Ashinaga, so I decided to reach out to them. My family was doubtful that a Japanese organization would accept a 6th grader, which is considered an elementary schooler in Japan, to volunteer. Much to everyone’s surprise, they welcomed me into the team and I have been working with them since. What was your experience like? What did you gain from this experience? Working with a well-established organization with a long history like Ashinaga as well as a smaller organization like SKY Labo with a start-up mentality has allowed me to observe the inner workings of nonprofits from many angles. How did this experience influence your plans for the future? Being able to first-handedly experience the direct impacts of organizations like Ashinaga and SKY Labo has allowed me to understand the impact of working directly with people. While I am currently exploring various disciplines and fields, I know for sure that I would like to work directly with people in my future. Christina Weiler ‘21 is studying Environmental Economics and is involved with the Thought Into Action entrepreneurship program at Colgate. Community service is giving of yourself for something greater than yourself. It is taking stock of your strengths and applying them to a project that improves the lives of others and/or our natural environment. In my experience, service can remove me from what I thought was my “comfort zone,” and orient me into a feeling pretty human and familiar. By this I mean that doing for others is a right and natural thing. I applied to Colgate’s entrepreneurship program the summer before my first semester. When I attended my first Thought Into Action (TIA) lecture, I was suddenly free to tackle any problem I wanted, surrounded and guided by alumni mentors (AKA trained problem-solvers). The problem I chose was one I had thought about since elementary school: recycling. Everywhere I go, I see poor recycling performance, yet I also notice that people care tremendously for the environment and their community. An opportunity presented itself to address improper recycling habits and help people directly support the social causes they care about. So, I started The UCan Project, a nonprofit organization that motivates increased and cleaner recycling by empowering people to donate to local causes with every item recycled. UCan partners with businesses looking to enhance their social and environmental responsibility, who pledge to match each pound of recycled material with a donation of a meal to the local community. I have been lucky to have incredible experiences starting UCan. I have received guidance from brilliant and experienced alumni mentors through the Thought Into Action entrepreneurship program. They have helped connect me to amazing people, trained me to pitch my business in 60 seconds, and helped me file for nonprofit status with my organization. Being in college is a great time to start a project because of the incredible bounty of resources at our disposal. There are brilliant faculty members willing to advise, fellow students eager to support, and a alumni keen to offer mentorship. I even had the opportunity to fundraise at the bicentennial football game and alumni council meeting this fall, where generous alumni and parents donated nearly a thousand dollars within a few hours. I’ve met with President Casey to talk about what sustainability will look like on Colgate’s campus and beyond five, ten, and fifty years into the future. The support and resources here are truly incredible. At the end of UCan’s first semester running, in the spring of 2018, it was truly meaningful to donate the funds we raised to the Rescue Mission of Utica, a housing, dining, and educational center for homeless individuals and families. Being able to congregate students based on a mission of sustainability and local community betterment through UCan has been very impactful. 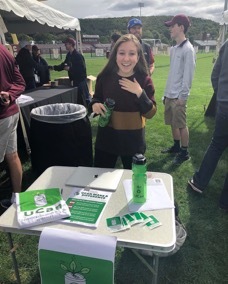 UCan has a team of several passionate, hardworking, and awesome students who work hard to integrate UCan into the campus culture (through planning advertising campaigns, cleaning up recycling bins, designing educational materials, and gauging feedback from the larger student body). Because of the experience working with these students, I now have a better understanding of which methods of recycling education motivate behavior change best. A big part of running UCan involves engaging with businesses and pitching a partnership with UCan as a pathway to achieving corporate social and environmental responsibility. This experience of nudging businesses into a more green direction has taught me that there is an environmentalist within all of us. People are not actively trying to degrade our environment. Instead, lack of action in part is a result of a lack of accountability. In the future, I want to innovate creative ways to hold individuals and business owners environmentally accountable. In many cases, people need a push — someone greeting them and offering a plan that fits within a reasonable budget, or even saves money. Connecting the right people to the right information at the right time makes the possibilities boundless. I am very interested in sustainable business and public policy and would love to enter one of these fields after college. Are you involved in a COVE group? I don’t regularly attend the groups, but I have attended a few meetings for CHOP, and intend to be more active this semester! Natasha working with children in Kolkata. To me, community service is about supporting those around me, and being there for those who don’t have the ability or resources to be there for themselves. My brother, who is eight years younger than me, was diagnosed in the autism spectrum when he was a baby. I have learned a lot about the value of patience and kindness supporting him as he has grown older, and how even the smallest contributions can make meaningful differences. I’ve transferred these skills when working in community-based organizations to support other people. The summer following my freshman year of high school, I volunteered as an English teacher at KidzPlanet, an NGO in Kolkata, India. The school was located in a village where there was a lack of access to educational resources. The private schools in the area would not accept children from the villages, and attending public school was an inconvenience for the families, as children are expected to be home and help support the household. The KidzPlanet school made a direct positive impact upon the village by giving children the chance to educate themselves. Through this, they found opportunities that may not have been otherwise accessible to them, such as jobs outside of the village apart from farming. Volunteering at KidzPlanet was my most meaningful experience because I was a part of an honest initiative helping children. I helped the children learn English by writing letters and short sentences, reviewing flashcards, and singing songs such as Row Row Row Your Boat. I observed firsthand the benefits of my contribution. I initially went to India that summer to volunteer at Mon Foundation, a psychiatric office in Kolkata, India that treats patients with mental disorders. My grandmother’s close friend worked here, and offered me the opportunity to volunteer for the summer. There, I specifically worked in group therapy sessions with children where I brought coloring worksheets to help engage and stimulate their minds. 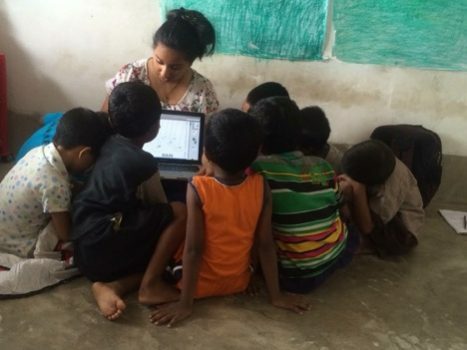 While volunteering at Mon, Dr. Bhattacharya, who helped co-found KidzPlanet, offered the opportunity to support these children in the village by teaching them English. My experience was very fulfilling, as I accomplished meaningful work in the time that I was at KidzPlanet. I gained a clearer understanding of how societal conditions really do not have much of an influence on the development of people’s personality and attitude towards education. Most of my students were always engaged, and had a great attitude in the classroom. Their circumstances in no way suppressed their learning, which I presumed might be the case prior to volunteering at KidzPlanet. I hope to, in the long term, work at an international institution or INGO (international nongovernmental organization) pushing direct impact on the international community by serving as a mediator between countries. I aim to dedicate myself to a specific, relatable cause that will unite countries to combat different problems around the world. Specifically, I care about climate change, access to educational resources, human rights, and respect for disabled individuals. Yes, I am currently the President of Circle K International. Adriana, left, at a rally for environmental issues. 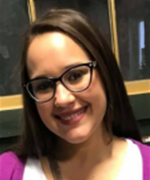 Adriana Rush is a first year interested in exploring the humanities and social sciences at Colgate. Before coming to Colgate, she was involved in three main initiatives relating to nonprofit work. 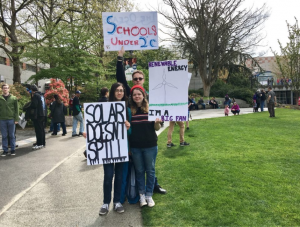 She canvassed for the Washington Environmental Council, pushing for green initiatives through legislation by promoting candidates that cared about environmental issues. She also has a fandom candle business called Magic Carrot Candles, part of which is nonprofit, with the proceeds going to different charities. 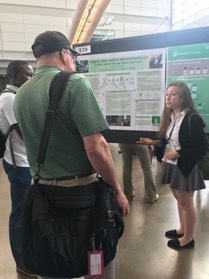 Additionally, Adriana helped jump start “Schools Under 2°C”—a school-based organization working with elementary, middle, and high schools across the globe to lower their emissions. Adriana and 15 fellow students started received the Presidential Environmental Youth Award for this initiative. Learn more about her experience with the nonprofit sector below. Simply going out there and doing something, really anything, that helps other people. And caring about making a difference as well as caring about whatever cause it is you are working for. There have been a few. I went canvassing for environmentally friendly candidates in various districts near my home, which was very enlightening as well as a meaningful experience. Additionally, I utilized my for-profit business, turning a large portion of into a nonprofit. Proceeds from our most popular products now go to various charities such as the Malala Fund and Greenpeace. Through that mechanism, we have raised over a thousand dollars for these causes. 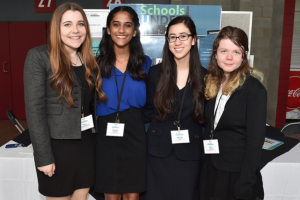 Adriana, second from the right, as part of a winning team for Schools Under 2oC at the Itron Food, Energy, and Water Challenge in 2017. When the current President was elected and brought a wave of climate change denial with him to the White House, I was inspired to simply do something about it. I looked up local environmental organizations in my area and signed up to volunteer. In terms of canvassing, I really enjoyed meeting other environmentalists like myself and going out into neighborhoods to talk about issues that I care about. Sometimes you meet people who are really receptive to what you’re saying and that’s great, but other times they just slam the door in your face. Even so, you know what you’re doing is helping fight for a good cause and there is definitely pride in that. In terms of the nonprofit, it is incredibly rewarding to donate money that we made through hard work to organizations who really have the means to help people. It makes me very happy every time I see that a customer bought one of our nonprofit products because they can feel good about that purchase and we feel good about it as well. I definitely want to continue volunteering for environmental organizations in the future, but on top of that, I also want to have a job that does something good for people too. I don’t think I could be content working in a job that wasn’t working to improve people’s lives. 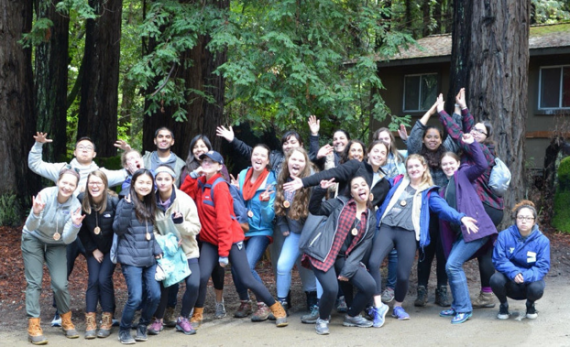 The Max A. Shacknai COVE advises 39 student-led, community-based volunteer teams. These teams cover a wide range of issues and help students build an abundance of skills. 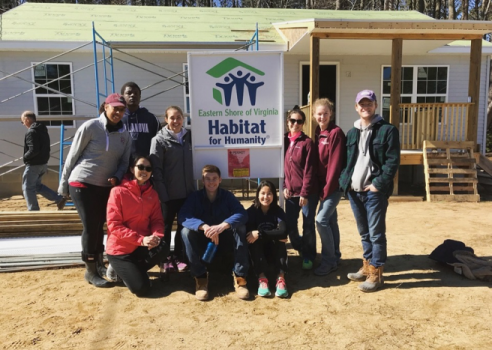 Approximately 650 students — representing about 23 percent of the Colgate population participate regularly in a volunteer team. This year, volunteer teams performed more than 23,000 hours of service in the local community. Colgate Caretakers – Colgate Caretakers works with Abraham House in Utica, a unique hospice that takes in patients with terminal diagnosis and prognosis of three months or less. They provide round-the-clock care in a comfortable, home-like environment to all patients regardless of income level or ability to pay. Volunteers can become a buddy of a trained caretaker, receive free caretaker training at the house, help organize and run fundraising events, plan and attend events at the hospice or on campus, and more. 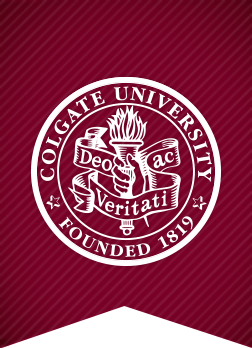 The Colgate Hunger Outreach Program raised funds that were used to fill holiday stockings with hygiene products. These stockings were distributed to families in need during the local Mid York Interfaith Holiday distribution. Our education-related teams sponsored two brown bag presentations; one on Critical Pedagogies at the Secondary Level and one on Education in Madison County. Habitat for Humanity hosted their annual gingerbread house making competition fundraiser. Sidekicks partnered with other mentoring groups to host our Sidekicks Carnival for children from around the community. Student volunteers from SOMAC hosted many community awareness events; including an event at Hamilton Elementary School. 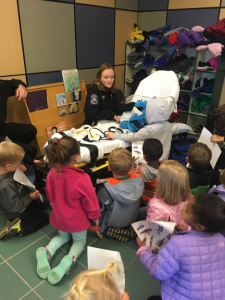 Children were invited into the ambulance and taught some basic skills on what to do in an emergency. Pet Pals held a blanket making night; students gathered to make bedding for animals which were then donated to local animal shelters. The American Heart Association team sponsored a Spin-A-Thon and a Burrito Run fundraiser. Rotaract sponsored a film screening fundraiser of Get Out at the Hamilton Movie Theater. A number of our volunteer and mentoring teams hosted campus visits for their students to have a fun day out eating at Frank and doing a special activity. The Network sponsored a Take Back the Night March and Speak Out, offering a safe and supportive opportunity for sexual violence survivors and the people who love them to publicly affirm their transition from victim to survivor. The Network partnered with the Haven, Colgate’s survivor support center, to train volunteers for the local sexual violence hotline. The Max A. Shacknai COVE exists through the efforts of individuals. During the course of the year, we have had a number of opportunities to recognize the work of others. This award is given to the most worthy individual, residential unit, or group at Colgate which through the year immediately preceding the award has given significant service to the local community. This service exemplifies an understanding that we are part of a larger community and that volunteer service and civic participation are part of the responsibility of well-educated women and men. Katie Steklac ’18 and Caroline Walsh ’18 were awarded the 2018 Dean’s Community Service Award. Dan Miller ’19 and Siena Frost ’19 were awarded the Projects for Peace award in support of their project, Countering Violent Extremism through Intercultural Dialogue. 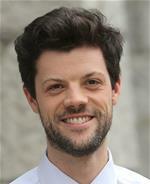 Frost and Miller plan to study and promulgate a new approach to countering violent extremism and fostering interethnic cohesion in multicultural society. Their test case is Brussels, Belgium, where local officials are using intercultural dialogue to integrate an alienated Muslim population into mainstream culture. 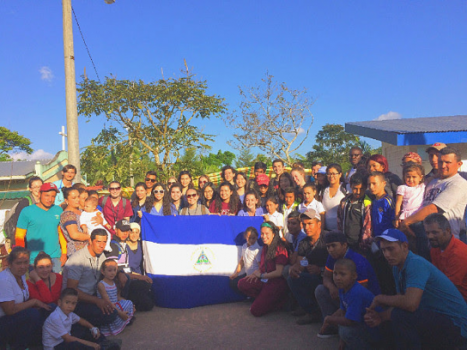 The project was funded with a $10,000 grant from Projects for Peace, an initiative for undergraduate projects designed to find solutions to conflicts. Projects are conducted during the summer, and can focus on an issue anywhere in the world, including the U.S. The Projects for Peace grant is available to students in 90 colleges and universities affiliated with the Davis United World College Program, an organization that provides scholarships to its partnered institutions. On Wednesday, April 4, the COVE held its annual Celebration of Service recognizing, the great work that student volunteers have completed in the last academic year. We recognized a number of individuals for outstanding commitment to community. 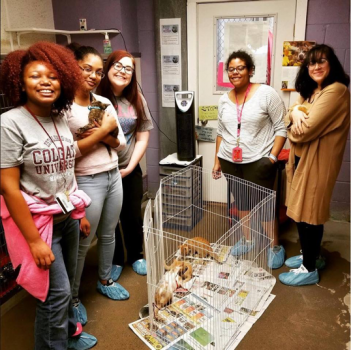 The Max A. Shacknai COVE continues to offer opportunities to deepen student understanding of complex social issues by providing opportunities for immersive experiences in environments very different from those available in the local community. Students participate in a series of preparation and reflective activities to create a rich learning opportunity. Alternative break trips are not discrete one-week experiences. In addition to committing to a work-intensive week, students are responsible for attending predeparture meetings that introduce the participants to the community and organization with which they will be working and the critical issues with which they will be dealing. Those who participate are civically engaged students interested in effecting sustainable local and global change through a continued commitment. In total, 63 participants in these programs contributed more than 2,900 hours of direct service to these communities this year. Habitat for Humanity Spring Break Trip, Exmore, Va.
Students traveled to Exmore, Va. to work with the Eastern Shore of Virginia Habitat for Humanity. The group installed insulation and hung sheet rock in a house being built for a local family. Habitat for Humanity houses are simple, decent, and affordable to low-income families. Whenever possible, Habitat for Humanity builds energy-efficient, sustainable housing. The goal of Habitat for Humanity is to help solve the global housing crisis and help the 48.5 million people living in poverty. Hunger and Homelessness Outreach Winter Break Trip, Washington, D.C.
Camp Campbell Outdoor Science School, Boulder Creek, Calif. 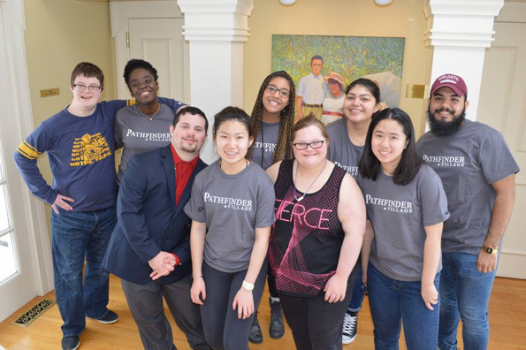 Leadership Program Development with Pathfinder Village in Edmeston, N.Y.
Pathfinder Village is a caring community offering independence to people living with Down Syndrome and developmental disabilities. 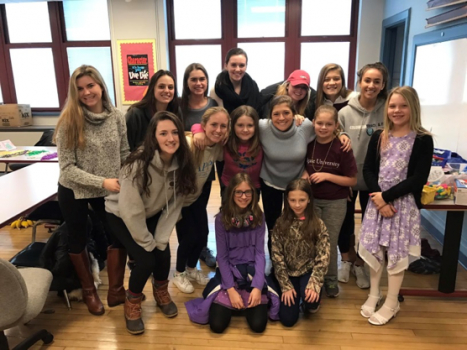 Six Colgate volunteers participated in a five-day inclusive team-building program designed to build shared learning, mentoring, and coaching relationships between Pathfinder Village secondary students and college-age peers. Student volunteers are paired one on one with a resident for the duration of the week and each team works together on a variety of challenges. Activities include a ropes course, hike, cooking competitions, and planning a St. Patrick’s Day event for other residents. The goals of this trip are to build relationships with Pathfinder staff and residents while providing the organization with valuable service that will impact the lives of participants for years to come. The deep immersion experiences described above are significant to students in terms of their ability to make meaning of what they learn in the classroom through direct application. Students have the opportunity to reflect on their personal values and ethics through the lens of often difficult experiences, leading to profound questions and conclusions. Joining with Alumni Affairs, Career Services and Institutional Advancement, the Common Good Professional Network continues to grow and offer many networking and development opportunities for students and alumni. Two key initiatives saw great success again this year. The weekend kicked off with an invite only dinner on Saturday night where 25 student leaders and the alumni had a chance to have small scale conversations.On Sunday morning, more than 60 students filled Merrill House to hear Dr. Nicol Turner-Lee ’00, fellow at the Brookings Institution, speak about her work on public policy designed to enable equitable access to technology across the United States and harnessing its power to create change in communities across the world. Following the keynote, more than 60 students participated in two alumni panels, one focused on human rights careers and one focused on environmental sustainability career paths. Overall, students came away inspired to live an intentional life of impact no matter what path that takes. Last November, 15 students visited four nonprofit organizations with Colgate ties; CCS Fundraising, NYC Department of Housing Preservation and Development, Robin Hood Foundation, and Uncommon Schools. The opportunity to meet with alumni in varied positions across organizations doing impactful work helped to clarify what paths exist and how to navigate a common good career. Students gained insight into fundraising, grant making, program development, public housing and youth development and education programs. Each alumnus was eager to tell their story and offer contacts and mentorship to students who took their break week to think about a nonprofit career. At the end of the day meeting with inspiring alumni, students were joined by more than 30 other alumni working in the Common Good sector across the city at a reception at the Cornell Club, where they had the opportunity to network and ask questions about their own career aspirations from those that have navigated the field. Overall, students found that real and exciting possibilities exist to put their Colgate education to work building a more just world.